This is a fun Giveaway for all of you Moms who long to see your precious little girls grow in the grace and knowledge of our Lord Jesus Christ! This beautiful book by Dannah Gresh (with Janet Mylin) is stock full of fun devotions -365 to be exact- for you to curl up and share with your girl (s). I love the Girl Gab sections which have some fun topics for conversation, activities and random fun for connecting. 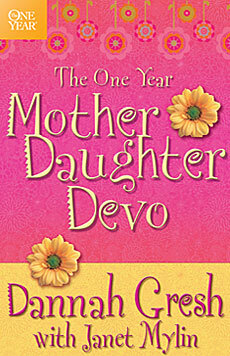 The One Year Mother Daughter Devo. Can you think of someone you know who would love this book? Would you love it for yourself? The One Year Mother-Daughter Devo is designed to be used by a mother and her tween daughter; both can read and understand the same devotion and share in the “girl gab” section to discuss their understanding of Scripture and their relationship with God. The devotion will strengthen mother-daughter relationships as well as their relationships with God. Topics for the devotions are centered around issues that the best-selling author, Dannah Gresh is known for addressing through her books and mother-daughter conferences. Topics include modesty, purity, self-esteem, handling emotions, witnessing, living the faith. *I was not compensated for this endorsement although I did receive the book in a giveaway. want to share/gift this devotional in the comments. Pass along the blessing via Facebook, Pinterest, Twitter or whatever way you want! They are all in the Sidebars! I will announce a winner on September 24th! Great Marissa! Maybe I should change that to just comment for a chance to win! lol. Lots of great ideas, and I love reading Devotionals. Bite sized bits of faith. Thanks, will link! I would love to win this book. I am looking for a devotional for my daughter and I to read together. i love the idea of doing a devotional specifically geared toward my youngest daughter! I too love the idea of having a devo geared for my girls. I have 3 girls, aged 11-15, and I need to find another way to connect with them, and help them develop a personal devotional time. Thanks all for entering- Winner announced: BARBIE!